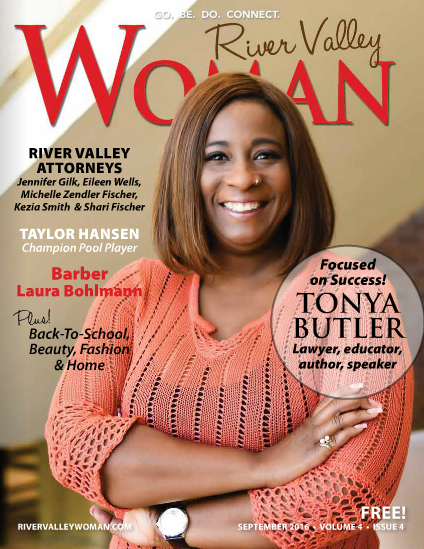 Tonya was the cover feature in the River Valley Magazine in September 2016. View the magazine and article here. Tonya Butler, professor of music industry studies, is a big fan of Clint Eastwood movies. “For a Few Dollars More” she finds a lesson in self-determination. A scene in the spaghetti western has a reverend gunslinger on a train bound for Sante Fe – but he plans to get off in Tucumcari. When he’s told the train won’t stop there, he looks at the man and says, “This train will stop in Tucumcari,” and pulls the emergency cord. Her comfortability in front of large groups has given her more than just furniture and electronics. She recently won the Toastmasters Humorous Speech Contest for the entire state of Minnesota. Tonya was used to the hustle and bustle of Los Angeles, where she worked as an entertainment lawyer. The Midwest lifestyle has been a big change. Contributing to student’s education and making a positive impact is what motivates her. She wants to lead a life that gives back to people. With three years under her belt at Minnesota State Mankato, she’s helped spread big ideas and transfer her knowledge of the music industry to students who need it. Do you play any instruments? No, I’m the only faculty member in the department that that doesn’t play an instrument. What is it you like about music? I just love the way it makes you feel. There are very few things that can make you feel good when you’re feeling bad and music is one of them. What did you do for fun growing up? Fun for me was singing in talent shows even though I wasn’t a great singer and reading and learning even outside of school. I was one of those kind of kids. I was a little nerdy. Would you rather watch a movie or read a book? I would rather watch a movie. I like to see someone else’s interpretation. “The Good the Bad and the Ugly.” That is my movie. Which superpower would you choose? I would not want to read minds or see the future. I know that. Super speed so I can run fast and do stuff fast. Which fad do you wish would come back, and which do you wish would disappear? I wish skinny jeans would go away. I wish bell bottoms would come back and platform shoes. I’d like flared leg jeans. I miss those. Do you collect anything? Yes, I collect black angels. So, whether they’re ceramic or wooden or little statues, dolls, paintings; anything black angel. Are you in any clubs or organization? I’m a member of The Recording Academy. I’m the chair of business and industry for the College of Music Society. I’m a member NABFEM, which is the National Association of Black Female Executives of Music and Entertainment. What would you do if you weren’t a professor? If I wasn’t a professor, I would be a motivational speaker. I like to share stories. What does your perfect day include? My perfect day would be waking up when I want to, speaking or teaching for an hour or two, going to the mall, shopping or watching a movie, and then just spending time with family. Nothing special. I don’t have to be on a yacht or on a beach. I’ve done all that. Who is your hero/heroine? I have a friend; her name is Rhea. She has bone marrow cancer. She is like the bravest, most spiritual, person I’ve ever known. She’s my hero. Where in the world would you like to live? I’d probably want to live somewhere back in California, in southern California somewhere because I’d be closest to my family. What is the most courageous thing you’ve ever done? Jumping down the slide on a plane that had to emergency land. You don’t want to fly with me. I’ve had it happen three times. 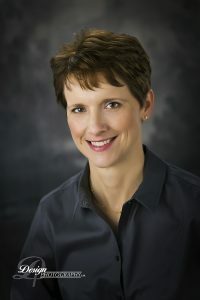 Besides her classroom, College of Business Professor Kris Rosacker is ready to travel halfway around the globe to know students on a personal level. “My biggest regret as a college student was I didn’t do a trip,” said Kris, a tax professor at Minnesota State Mankato. She’s made up for lost time by traveling with students to Europe and, most recently, on a January study tour to New York City. “I know some of the students didn’t necessarily have a best friend with and so I tried to reach out to those students in particular.” That willingness to engage is part of a teaching philosophy that values students by making time to know them – not just by name, but also by their interests and hobbies. According to Kris, a perfect teaching day involves talking to her students, whether it’s in the classroom, during a meeting or even by email. “I wasn’t involved as a student and so I try to connect with students and make sure everyone has someone to talk to,” she said. That special trait is continually self-examined. Every year she reflects on her approach to teaching and sets goals to be better than the year before. On a simpler note, life outside the classroom includes walks with her husband and their two Biewer Terriers, Mocha and Cocoa, and spending quality time with her three children. Learn what Kris’s biggest fear is and more! Who is your hero? My husband of 27 years is my hero. Bob is intelligent, compassionate, genuine, a great friend to many and a wonderful father to our three adult children. If you could live anywhere, where would it be? I was born and raised near Hastings, MN. After graduating from Minnesota State Mankato, I lived throughout the Midwest (OH, SD, NE, and WI) for 25 years before returning to MN. There is no place like home which is MN for me. What is your biggest fear? Failure. What is your teaching philosophy? The primary purpose of a university education is to prepare students to think on their own rather than to merely memorize and restate. Often this idea is simply stated as encouraging a life-long learning mentality. Furthermore, I take considerable efforts to learn the name and some personal background information (e.g., hometown, activities they enjoy, career goals) about each of my students. This serves to encourage a more personal relationship. What would you sing at Karaoke night? No, my voice is not intended for singing. If you could go back in time, what year would you travel to? I live in the present and plan for the future. If I traveled back in time I would miss out on what is going on today. How would your friends describe you? Nice. What are your hobbies? Walking has have been my primary hobby throughout life. In my opinion, the best way to learn about a new location (city, park, etc.) is to spend the day walking around without a real plan or destination in mind. If you could share a meal with any 3 individuals, living or dead, who would they be? My three children David (26), Tyler (23) and Sarah (20) as they are adults and live out of town. My husband and I cherish each moment we share with them. What is your favorite childhood memory? Holiday meals with my eight siblings, parents and grandparents—I am the sixth of nine children. What’s your favorite movie? “Mean Girls”, I have watched the movie many times with my daughter. Which of the five senses would you say is your strongest? I’m old, none of them are very strong anymore. What was your first job? My first full-time position was as an Enterprise System’s Instructor with the University of South Dakota. Ellen Mrja, mass media professor at Minnesota State Mankato, once fought a baby bull and won. While in Mexico, Ellen and her sister saw a demonstration by one of the country’s top bullfighters. When he asked the crowd for volunteers, Ellen stepped into the ring. Maybe it’s her spontaneity and willingness to get involved that leaves a lasting impression among Ellen’s students. She loves coffee, she jams to The Beatles and, yes, she believes pineapple belongs on pizza. And while her perfect day away from work includes reading a good book on her couch with her two Chihuahuas, Jade and Jazzy, she loves her time in front of a class. She’s motivated by the energy that is exchanged between her and her students. 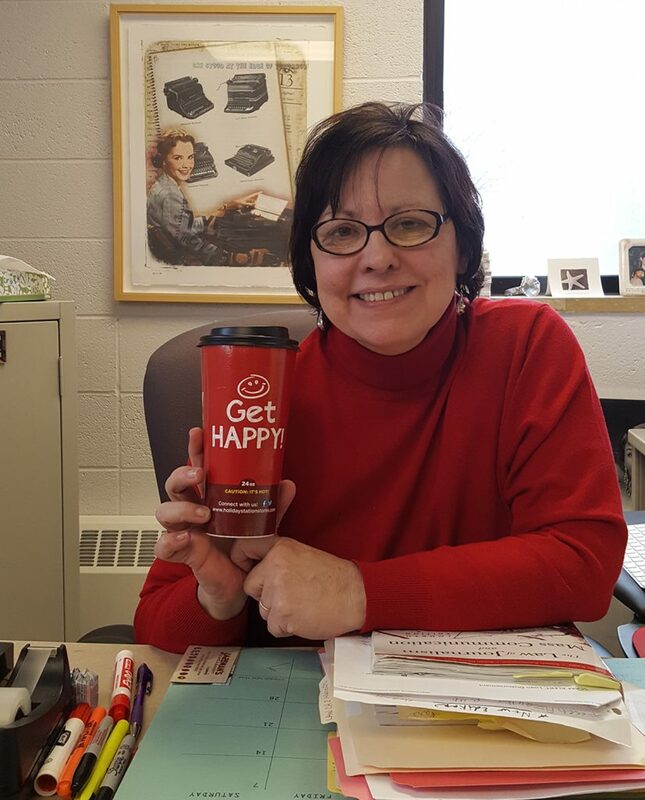 During her 35 years with the University, Ellen has taught the ins and outs of subjects like media law and public relations, but she has also learned from her students. She’d love to live in France where her daughter lives, or even in Italy where the streets are covered in statues from the Renaissance Period. For now, Minnesota State Mankato is fortunate enough to have her in the classroom teaching students about media and showing them how to stay on their feet. Did you play sports in high school? No, but I played softball and tennis outside of school. Would you rather read a book or watch a movie? Read a book. What three things would you need if you were stranded on an island? Coffee, book and I suppose I should take my husband too, huh? Do you know any second languages? I’m very bad at French. I learned enough Spanish to pass graduate school exams, but I doubt I could read Spanish anymore. Personal hero/heroine? My mother. She is the kindest woman I’ve ever known. If you hadn’t become a professor, what do you think you’d be doing? I really think I’d be a reporter In Washington D.C. covering the White House. What makes you happy? My life makes me happy.